Oh no! The devilishly evil badgers have escaped from prison and plan to unleash chaos on the town's residents. 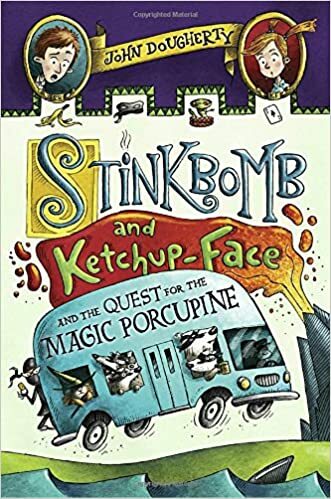 Have no fear, Stinkbomb and Ketchup-Face will rescue the day! They head out to find someone who knows about stories to help them find the correct path. Who else would know something about stories other than the fearsome Miss Butterworth, the ninja Librarian. After receiving guidance, the duo set off to find the magical porcupine to help stop the mischievous badgers. Will the kids be able to save the king? What evil deeds is the badgers planning? The story was fun to read and engaging, especially to young children. Many of the jokes were clever while a bit silly, but a few jokes were repetitive. However, I feel like that is a common trend in children's books (IE Lemony Snicket). A cute and delightful read for any young reader. Sam Ricks is an illustrator and designer with more than ten years' experience. His work has been showcased in numerous publications, including The New York Times. Sam loves creating illustrations of all types, but he is especially fond of children's book work. He lives with his family in Utah.